Brighton has a wealth of quality unsigned bands in their vicinity; one that stands out on their quest to be heard is The Dead Reds, a four piece band of talented individuals. Winners of the 2013 Brighton Music awards for best song with People Rise, from their EP of the same title. Their début album, Dark before the Dawn is due to be released on 25th January 2014, which means not only have they been in the studio to complete this, they have also been playing live endlessly around the music venues of Sussex to continue to form a relationship with fans and improve their talent and style. It begins with Born to Survive; bass line begins and is reminiscent of the start of F1 series that use to be on terrestrial TV that gets the heart pumping and ready. A short burst of the beautiful blues harp that with one sound makes emotions come flooding to the forefront, great start. A superb addition to ‘Stand Up’ is Thomas Miles-Woodbridge; his blues harp performance throughout this is exceptional and thought provoking. The flow with Jeremy Green on vocals and his bass, the blues guitar riffs by Geoffrey Wilcox makes Stand Up one of the highlights of the record, blues music and a classic rock touch gives a great feel to the mood of the album. It gets darker with ‘Put Whisky in the Glass’, a different feel with an upbeat sound but with deep dark lyrics about the hold that whisky has on their soul. Be safe while drinking people, saying that, it is a great drinking song that could be likened to Jim Croce’s ‘Cigarettes, Whisky and Wild Wild Women’ or one that would be perfect while entering rehab. Influences from The Doors are present during parts of this record with the likes of ‘Prey’ and ‘Dark Before The Dawn’, such darkness within the vocal style “there’s no more jobs left, for the underachiever”. ‘Apocalyptic City’ is a fight the power track, fast and furious with clear vocals, a mixture of The Doors and a sense of some Iggy and the Stooges. ‘Awakening’ is spoken word featuring Casper James the wordsmith. Woodbridge accompanies in the background gently playing the harp with Green tenderly strumming the acoustic guitar assisting in slowing this record down, (“Apocalypse was not to be ridden upon a horse but on a wave on unpaid debt causing inflation to saw”), a change of style and melody to the previous tracks, Casper James on the mic speaking of the pressures of this world, to stand and fight back. Final track is their award winning tune ‘People Rise’, the drum beat by Rosie Flint is strong and the passion cuts through this song like the government does with benefits and jobs; it’s a powerful tune but also has a touch of ‘Alone‘ by Stiltskin, (that was the Levi commercial back in the 1990s). Dark Before the Dawn a tight blues rock effort from The Dead Reds, proof again that talent isn’t always on the front covers of magazines or being interviewed by irritating fame hungry radio personalities. That may help as sometimes it is not what you know it’s who, The Dead Reds with this album is one to catch, one to buy and definitely one to see live. 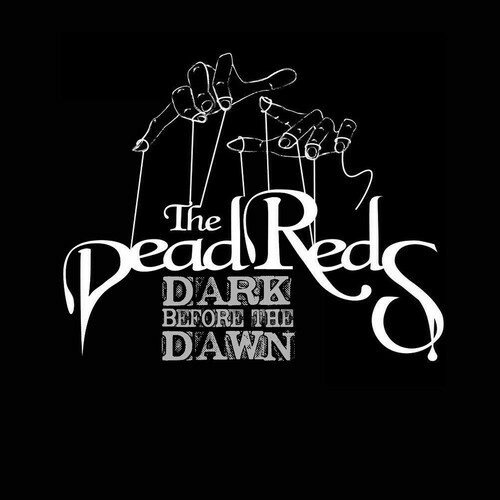 Check out their website http://www.thedeadreds.com/ if you wish to contact them and buy this album.